The Queen of Heaven is a title given to the Blessed Virgin Mary by Christians mainly of the Roman Catholic Church, and also, to some extent, in Anglicanism and Eastern Orthodoxy, to whom the title is a (disputed) consequence of the First Council of Ephesus in the fifth century, in which the Virgin Mary was proclaimed “theotokos“, a title rendered in Latin as Mater Dei, in English as “Mother of God“. The Catholic teaching on this subject is expressed in the papal encyclical Ad Caeli Reginam, issued by Pope Pius XII. It states that Mary is called Queen of Heaven because her son, Jesus Christ (Yeshua HaMashiach), is the king of Israel and heavenly king of the universe. The Eastern Orthodox Churches do not share the Catholic dogma, but themselves have a rich liturgical history in honor of Mary. According to Catholic doctrine, Mary was assumed into heaven and is with Jesus Christ, her divine Son and is represented in Book of Revelation 12 as the woman clothed with the sun who gives birth to Christ. Mary should be called Queen, not only because of her Divine Motherhood of Jesus Christ, her only Son, but also because God the Father has willed her to have an exceptional role in the work of the eternal salvation of humanity. The papal encyclical Ad Caeli Reginam, argues that as Christ, because he redeemed humankind, is its Lord and king by a special title, so the Blessed Virgin Mary is Queen, on account of the unique manner in which she assisted in the redemption of humanity by giving of her own substance, by freely offering him by her singular desire and petition for, and active interest in, human salvation. GotQuestions: Who is the Queen of Heaven? Jeremiah the Prophet wrote, “Do you not see what they are doing in the cities of Judah and in the streets of Jerusalem? The children gather wood, the fathers kindle fire, and the women knead dough, to make cakes for the queen of heaven. And they pour out drink offerings to other gods, to provoke me to anger” (Jeremiah 7:17-18 ESV). Likewise, Jeremiah the Prophet also wrote, “Then all the men who knew that their wives had made offerings to other gods, and all the women who stood by, a great assembly, all the people who lived in Pathros in the land of Egypt, answered Jeremiah: “As for the word that you have spoken to us in the name of the LORD, we will not listen to you. But we will do everything that we have vowed, make offerings to the queen of heaven and pour out drink offerings to her, as we did, both we and our fathers, our kings and our officials, in the cities of Judah and in the streets of Jerusalem. For then we had plenty of food, and prospered, and saw no disaster. But since we left off making offerings to the queen of heaven and pouring out drink offerings to her, we have lacked everything and have been consumed by the sword and by famine.” And the women said, “When we made offerings to the queen of heaven and poured out drink offerings to her, was it without our husbands’ approval that we made cakes for her bearing her image and poured out drink offerings to her?” Then Jeremiah said to all the people, men and women, all the people who had given him this answer: “As for the offerings that you offered in the cities of Judah and in the streets of Jerusalem, you and your fathers, your kings and your officials, and the people of the land, did not the LORD remember them? Did it not come into his mind? The LORD could no longer bear your evil deeds and the abominations that you committed. Therefore your land has become a desolation and a waste and a curse, without inhabitant, as it is this day. It is because you made offerings and because you sinned against the LORD and did not obey the voice of the LORD or walk in his law and in his statutes and in his testimonies that this disaster has happened to you, as at this day.” Jeremiah said to all the people and all the women, “Hear the word of the LORD, all you of Judah who are in the land of Egypt. Thus says the LORD of hosts, the God of Israel: You and your wives have declared with your mouths, and have fulfilled it with your hands, saying, ‘We will surely perform our vows that we have made, to make offerings to the queen of heaven and to pour out drink offerings to her.’ Then confirm your vows and perform your vows!” (Jeremiah 44:15-25 ESV). Clearly, the Queen of Heaven existed log before the Virgin Mary or the birth of the Messiah. This title referred to Ishtar (pronounced Easter), an Assyrian and Babylonian goddess also called Ashtoreth and Astarte by various other groups. She was thought to be the wife of the Baal, also known as Molech. The motivation of women to worship Ashtoreth stemmed from her reputation as a fertility goddess, and, as the bearing of children was greatly desired among women of that era, worship of this “Queen of Heaven” was rampant among pagan civilizations. Sadly, it became popular among the Israelites as well. The title Queen of Heaven was a title given to a number of other ancient sky goddesses in the ancient Mediterranean and Near East, in particular Anat, Isis, Innana, and Hera. Elsewhere, Nordic Frigg also bore this title. In Greco-Roman times Hera, and her Roman aspect Juno bore this title. Forms and content of worship varied. Jesus publicly rebuked a woman who blessed the Virgin Mary, “As he said these things, a woman in the crowd raised her voice and said to him, “Blessed is the womb that bore you, and the breasts at which you nursed.” But he said, “Blessed rather are those who hear the word of God and keep it” (Luke 11:27-28 ESV). There is no Queen of Heaven. There has never been a Queen of Heaven. There is most certainly a King of Heaven, the Lord of Hosts, Jehovah. He alone rules in heaven. He does not share His rule or His throne or His authority with anyone. 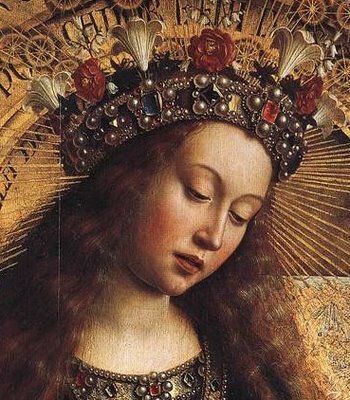 The idea that Mary, the mother of Jesus, is the Queen of Heaven has no scriptural basis whatsoever, stemming instead from proclamations of priests and popes of the Roman Catholic Church. While Mary was certainly a godly young woman greatly blessed in that she was chosen to bear the Savior of the world, she was not in any way divine, nor was she sinless, nor is she to be worshiped, revered, venerated, or prayed to in any way.